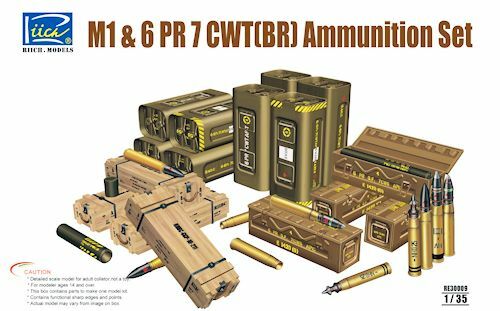 Riich Models 1/35 "US M1 57mm & 6 Pdr Ammunition Set"
Weapons sets are generally popular with those who like to do dioramas and those who want to add something to what they already have. In this case it is ammunition for the US 57mm gun and the British 6 Pdr. The set is quite complete with four different types of shell: SVDS, AP, APCBC-T and HE. 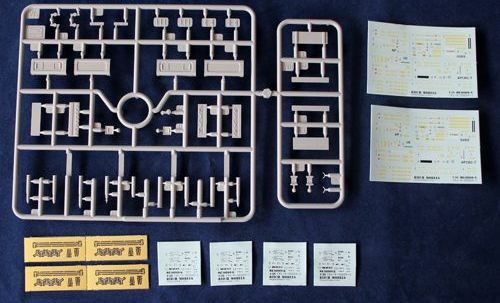 There are four sets of sprues that are identical and contain what you see in the image. This is not only the shell, but also the box they come in as well as decals for marking each one of the rounds and their cases. Photo etch is also includes for some of the cases. There is a full painting guide on the back of the box that includes paints from Hobby Color, Mr. Color, Humbrol and Tamiya. In all, an interesting and unusual set.